john ross. | SharePoint Stuff. The Future of SharePoint is Coming! It is safe to assume that just about anyone reading this post is likely interested in SharePoint — in my case in particular I’ve been working with SharePoint since the early days of SharePoint 2007. At the time, SharePoint’s popularity exploded and the momentum continued for through the release of SharePoint 2010 and then into SharePoint 2013. It was shortly after the release of SharePoint 2013 that Office 365 began to gain traction and the community started to wonder about the future of SharePoint. Was SharePoint dying? Was it already dead? There were more than few that wrote articles about it like this one or this one. I’ve heard more than a few people in the community wonder what it all means for their careers. In my case, as a Product Manager at Rackspace responsible for our SharePoint offering my leadership had even asked about the future of SharePoint. But amid all the uncertainty, the strength of the SharePoint community stood out — I’d always felt that there was no way Microsoft would make a decision that would make risk jeopardizing one of the biggest and best technical communities anywhere. In the summer of 2015, things started to become more clear. It was announced that Jeff Teper (who some refer to as “the Father of SharePoint”) returned to lead the SharePoint business. It was at that time that he made very clear that SharePoint was back. The next release would be SharePoint 2016 and be the first version of the product that was born completely in the cloud using lessons learned from running SharePoint Online as part of O365. Microsoft will be unveiling SharePoint 2016 on May 4th in a live event from San Francisco. You can check it out here. If you haven’t had the chance to play with the recently released RTM (Release to Manufacturer) bits, you’ll get to see and hear about many of the great new features that will be part of SharePoint 2016. But even if you have had the chance to try RTM you should still make sure to tune in for the webinar. SharePoint is NOT dead! Far from it! The release event will help to lay out the vision for where SharePoint 2016 is going but also where is SharePoint going into the future. I wouldn’t be surprised if there’s some new information Microsoft has been holding back for this event. They wouldn’t have a launch event out in San Francisco only to talk about features in a product that anyone could download. The Future Promises to be Bright! I’m more excited about SharePoint than I’ve been in a long time. 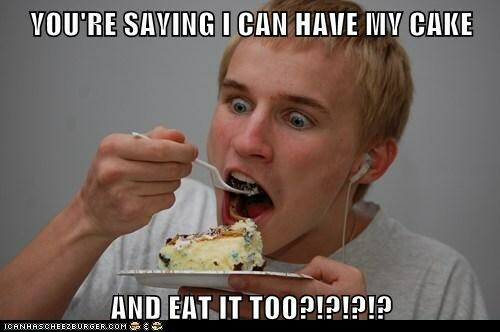 At Rackspace we’re chomping at the bit to start putting customers on SharePoint 2016. Not only do we have a strong SharePoint practice but we also support Office 365 and Microsoft Azure. SharePoint 2016 is going create new ways for users to collaborate and hybrid environments are going to enable customers to leverage SharePoint and Office 365 that matches their company’s needs. Whether a company is ready to put 100% of their content in Office 365, or whether they need to keep 100% on-prem, or somewhere in between Rackspace is here to help you along the way at every step of your journey. And Microsoft makes it possible! Make sure you go register for the Future of SharePoint launch event! Keep an eye out for the link to our Rackspace live blog which will be feature fellow Rackers and MVPs Todd Klindt, Jason Himmelstein, Randy Drisgill, and myself. And if you still can’t wait you should check out the Unveiling SharePoint 2016 with Microsoft webinar that Sharegate put on with Microsoft Senior Technical Product Manager, Bill Baer. It will be a good primer! Stay tuned because 2016 and beyond is shaping up to be an exciting time to be part of the SharePoint and Office 365 community! Thanks to everyone for coming out to my session today! As promised here’s the slide deck. Please feel free to reach out with any questions. Connecting a Mac with OSX to SharePoint (including O365)! These days my primary laptop is an Apple Macbook Pro 13″ — it is a pretty sweet piece of hardware. There’s plenty of other folks in the SharePoint community that have been making a similar switch recently like Andrew Connell and Jeremy Thake and Sahil Malik. Everyone seems to be singing the same praise for the Macbook Pros and perhaps surprisingly most that have made the switch are choosing to run in OSX as their primary operating system. I’ve been running this setup since last summer but most days when I’m SharePointing I use my Windows desktop. As I was getting ready for the upcoming SharePoint Conference, I was preparing for the session I’m co-presenting with Randy Drisgill called Branding Internet facing web sites with SharePoint in the cloud (which you should come see!) I was running through some of the demos and realized that I should probably try to do them on my MBP. One of the demos involves the Design Manager connecting to an SharePoint Online site in Office365. No problem right? Wrong. The usual steps of connecting to an external didn’t work (open up Finder, then Go > Connect to Server). I scoured the interwebs looking for an answer, I tried emailing different folks at Microsoft, and didn’t really have much luck. At that point I did what everyone else would probably do: I complained on Facebook. I’m glad I did because I found the answer in an unlikely place — from the husband of someone I went to high school (maybe even middle school?) with. Big thanks to Scott Newsome! SharePoint On-Premises Or In The Cloud? Why not both? Last summer I wrote an article discussing SharePoint in the cloud and what it actually means. If you wanted to check it out you can find it here: https://johnrossjr.wordpress.com/2013/03/13/sharepoint-the-cloud-and-you/ The article was a response to the common question I hear all the time around what it means to put “SharePoint in the cloud.” The basic summary is that cloud comes in different flavors and each one presents different pros and cons. If you’re still exploring the decision of going to the cloud that article is a good starting point. But there’s another side to the discussion, you’ll often hear the idea of SharePoint in the cloud compared to keeping SharePoint on-prem which is short for on-premises. What exactly does on-prem mean these days? You might be surprised to learn that it doesn’t always refer to a location – in other words you can have “on-prem” SharePoint that lives “off-prem” which includes the cloud. The topic can get very confusing because as businesses evaluate SharePoint in the cloud they’re often trying to make a decision between putting SharePoint on-prem (in their local data center) or moving to the cloud. This is precisely the topic of my previous article. The reality is that if your company makes the decision to move SharePoint to another data center you still might need SharePoint on-prem. If that last sentence is confusing, stick with me. I’m about to explain. How can my SharePoint be both in the cloud and on-prem? SharePoint is installed on servers in your data center. SharePoint is installed on servers as at a hosting provider. SharePoint is installed on virtual servers in a cloud such as Amazon. Even SharePoint installed in Microsoft’s Azure uses the on-prem build! As you can see, it is absolutely possible to have SharePoint in the cloud and use the “on-prem” version of the product. If the answer to the previous question is that you would like someone else to host and your SharePoint environment (ie. You chose to move to the cloud) will you use SharePoint Online or a different option? The moral of the story is that you’re using the on-prem version of SharePoint in all cases, even cloud scenarios unless you’re using SharePoint Online. This is an important distinction because as we get closer to Microsoft’s SharePoint Conference 2014 you’ll begin to hear about things like the “roadmap for on-prem” or other topics that make reference to “on-prem.” The terminology is very confusing and it is possible that depending on the context of the conversation or presentation the meaning could be different. Moving SharePoint to the cloud is something that I think every customer should be investigating. The terminology can be very confusing, the terms “cloud” and “on-prem” get thrown around a lot and can make you dizzy if you’re not careful. But at the end of the day the decision comes down to whether you want to host SharePoint locally or with another provider. Once you figure that out, just remember that even if you decide to move SharePoint to the cloud you might still be using the “on-prem” version of SharePoint. I thought I’d repost over here on my blog with a short intro. Just to clarify, yes I work for Rackspace. Yes we have a ton of cloud products but this isn’t a marketing post! One thing I’ve found in my discussions throughout the SharePoint community is that cloud means different things to different people. In many cases, people think cloud refers to only one type of thing. But in reality there’s different flavors of cloud. There’s tons of benefit to the cloud and all flavors — but each flavor of cloud has different pros and cons. You can even mix and match types of cloud into hybrid scenarios to do even more great things. Take a look, I hope this serves as a good conversation starter. Feel free to reach out on twitter (@johnrossjr) or leave comments below if there’s other SharePoint and cloud topics you’d be interested to hear more about. One of the more common discussions that I keep hearing over and over is around SharePoint in the cloud. This is a great topic but there seems to still be a lot of confusion and misconceptions about what it means for SharePoint to be in the cloud. In this blog post I’m going to try to clarify some of these more common issues. To simplify that even more, by this definition cloud computing would include anything where your hardware and software is not hosted in your own data center and instead made available by a service provider. This definition is a bit more broad than most of the ones that I’ve heard from organizations that are considering moving SharePoint to the cloud. Infrastructure as a Service (IaaS): A provider manages the hardware. Very similar options and flexibility to hosting SharePoint on-premises but the provider takes over the day-to-day operations and maintenance of the hardware. Remote access and ability to develop and create custom solutions against this type of farm are typically the same as on-premises. Examples of IaaS would include Rackspace, Peer1, and other managed hosting providers. Software as a Service (SaaS): In this case, all an organization needs to do is sign up and they are provided access to the application. All hardware and software is managed by the provider. From a SharePoint perspective SaaS would include Microsoft’s O365 and any other vendors who’d provide SharePoint in a Multi-Tenant configuration. This option tends to be less expensive, but also has less flexibility for customizations. Platform as a Service (PaaS): Platform refers to the cloud platform itself. There are several options for this including Rackspace’s OpenStack, Amazon’s AWS, and Microsoft’s Azure. With this option an organization would pay for the amount of the cloud platform they’d consume. For example instead of installing Windows, SQL, and SharePoint on physical servers, it’d be installed on virtualized infrastructure running in the cloud. Typically, companies would still manage their own environment and the provider would just provide and manage the cloud platform itself. Which option is the right fit for your organization? The answer is the dreaded “It depends.” There’s significant value in leveraging the cloud, but it important to remember that cloud comes in a number of different flavors and in some cases combinations of cloud options make the most sense. These are referred to as Hybrid Cloud. If someone were to ask me “Should we be looking to move our SharePoint to the cloud?” my answer would be a very enthusiastic “Yes!” While I think all organizations should be exploring how moving their SharePoint to the cloud, I also recognize that the cloud isn’t going to be a great fit for everyone. Certain organizations have security or regulatory constraints that make going to the cloud impossible. All organizations should be evaluating the cloud as a way to get more value from SharePoint. But SharePoint in the cloud comes in several different flavors, each with its own pros and cons as well as costs. It is important to weigh all of the various cloud options and consider the security, flexibility, total cost, and functionality you get from each option. My advice is to take your time and do your homework. Happy SharePointing!! 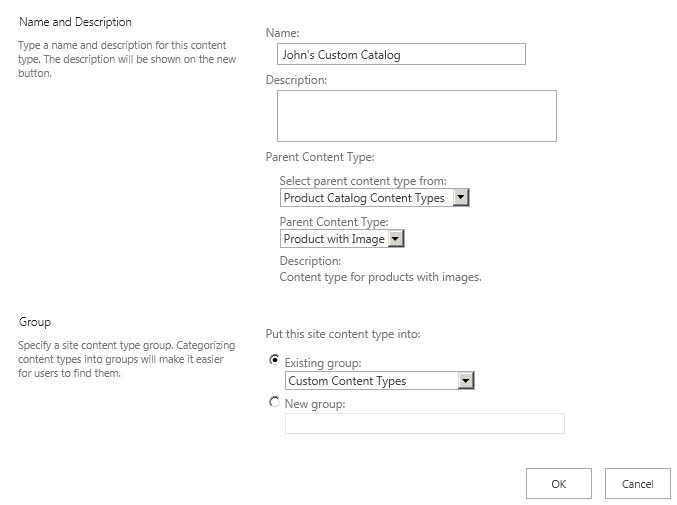 The other day I blogged about the new WCM functionality in SharePoint 2013. If you haven’t read the post it basically talks about all the powerful new functionality that’s available with WCM in SP2013 because it’ll use search to drive content management. In this post I’m going to start getting into a bit more detail about what’s required to start actually using the new WCM functionality. I’ve been searching around on the interwebs and haven’t really seem much information from Microsoft yet — although I’m sure it’s coming. For anyone looking to get a jump start hopefully this will help. Product Catalog — You can think of this as almost a published list or library. Unlike content from SP2010 which was usually entered into pages via page layouts, we are just talking about fields that get filled out — just data pretty much. Creating this first piece is going to be the subject of this post. Managed Metadata — This feature was introduced in SP2010 and then improved and expanded for SharePoint Server 2013. It still is where you’ll setup your enterprise taxonomy for your data but there’s additional functionality now that can be used to drive navigation as well as some other WCM goodness which I’ll cover in another post. Search — There’s tons to discuss here, but for right now the important takeaway is that as you work more with the new WCM features you’ll spend a lot of time dealing with search. If you aren’t too familiar with search, there can be some gotchas you’ll run into. I’ll point a few out in this post. Display Templates — This is the primary way to style the results from the Content By Search (CBS). In SP2010 designers working with a WCM site needed to customize the ItemStyle.xsl to control the way results came back for the CQWP. Display templates are the way you’d style the results from the CBS — I don’t expect to get too deep into this. I’ll leave that to my good friend Randy Drisgill — be sure to keep an eye on his blog. I’m sure there’s more I’m forgetting about, but the there’s going to be plenty of time to fill in the gaps. The goal here is to just get you started with the basics. On that note — let’s start at the beginning and walk through the steps for creating a simple catalog. 1– The first step in the process is to Create a site collection using the Project Catalog template. To do this open up Central Admin and from Application Managed click the link to Create Site Collection. From here you’ll want to click on the Publishing tab and choose the option for Product Catalog. Give it a name, URL, and set up a site collection administrator and press OK.
3– With your site columns created, the next step is to create a new content type. From the Site Settings page click on Site Content Types under the Web Designer Galleries section. From this page click on the Create button. On the screen that opens enter in the name for the content type, choose the parent content type to select from (Product Catalog Content Types), the parent content type (Product with image), choose what group you want to place it in, and then press OK.
4– On the next screen is where you’ll add any custom fields you created to the Content Type. Choose the link that says Add from existing site columns, choose the ones to add and press OK at the bottom. 5– Next browse to the default Products list (or another one if you want to go that route), from the ribbon at the top choose the List tab and click the List Settings button. Scroll down to the Content Types section and click the link to Add from existing content types to associate our new content type to this list. Once we’ve done that go to the All Items view and make sure any custom fields we’ve created are also showing. 6– While you are in the List Settings page, click on the link for Catalog Settings. From here you’ll want to make sure that the list is setup for Catalog Sharing, specify the field(s) to be used as the primary key, and then specify the field to be used as to determine the navigation (This is the one that needs to be the managed metadata field). Then press OK.
7– This is the easy part. All you’ve got to do now is fill the list with content. But there’s a couple gotchas here that are important to point out. The first is that we’ve created new site columns so if we want the new site columns to get added to the search schema and index the items have to be filled out and the new fields have to have data in them. The second thing to remember is that once you’ve added all of your content to the list, remember that the list has approval turned on. So you’ll need to make sure all of your items are published or you’ve disabled content approval or search won’t pick up the items (this one in particular initially tripped me up). 8– There’s one other tricky little step that we need to ensure we do. That is to give permission to the site collection which will be consuming our product list so that it can access the term set. To do this go to Site Settings and from under the Site Administration section click on Term store management. At the left click to select the term store associated with your site collection and the general tab will be displayed at the right. You should see a field labled Site Collection Access. In this field type the URL of the site collection where you’ll be consuming the product catalog — if you haven’t created this, you should do that now and use the Publishing Portal template. Then type the URL into here and press Save. 9– The next step is to kick off a crawl to make sure everything we’ve done so far gets added into the index. To do that go to Central Admin and click on Manage Service Applications from under Application Management. Click on the Search Service Application link to bring up the search administration page. At the left click on the Content Sources link under the Crawling section. Hover over the name of your content source called Local SharePoint sites, click the drop down, and choose Start Full Crawl. Now is about the time you should go get a tasty beverage or something. When you get back you can click the link that says Refresh to check on the status of things, but it’ll probably take anywhere from 3-10 mins depending on how robust your server is. When the status says Idle you’ll know you are ready to move on to the next step. 10– Now’s the time you’ll want to go to that Publishing Portal that’s going to be used consuming the catalog. 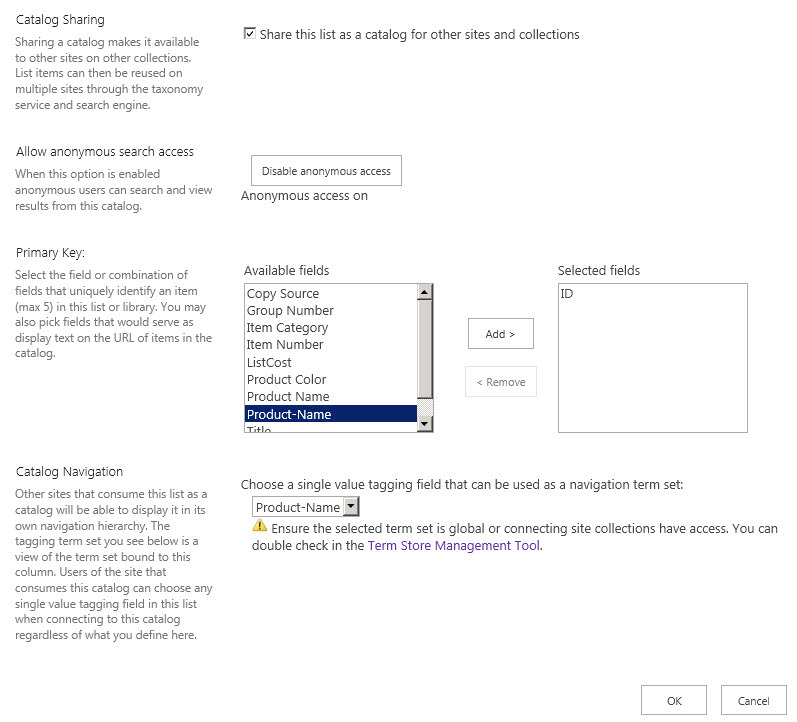 From Site Settings click on Manage catalog connections under the Site Administration section. Click on the link that says Connect to a catalog. The next page that opens should show the URL to your catalog. Click on the Connect link at the right. The Catalog Source Settings page will open. There’s a lot of great options here, but for this post we’ll just go with all of the defaults. But we will need to select a Root term of heirarchy from under the Navigation Heirarchy section. This is what I was referring to in step 2. If you compare the image below to the one from step 2 it should help to clear things up. This was another area that originally was a little tricky when I was trying to choose the root node at the wrong level. Once complete press OK.
11– When the page reloads you should notice that the navigation at the top of the page is being driven by the metadata. Also, if you go into the Pages library of the site you’ll notice two pages have been created — these are those page templates I was referring to earlier. If you try clicking on a link from the navigation take a look at the URLs — you’ll notice they are dramatically different from the URLs we’ve been used to in SharePoint in the past. This is something that will definitely be the subject of future posts but the the basics are that when you setup the catalog connection there was a section with options that described the Catalog Item URL Behavior and the default is to make all URLs relative to the site. Despite the fact the content lives in another site collection, it doesn’t appear that way. This post was intended to be a guide to getting started with the first step in working with the new WCM features in SharePoint Server 2013. As I’ve mentioned throughout this post, there are a number of areas that will be important to explore in more detail at a later time. If anyone has any requests I’d love to hear them — can’t promise that it’d be something I’ve looked into yet but will definitely do my best! 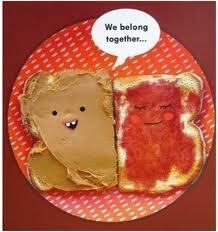 Few things in this world go together better than peanut butter and jelly. It’s a proven fact by the 3 people I’ve personally surveyed. When Microsoft announced SharePoint Server 2013 the piece that I was the most excited about was the new Web Content Management (WCM) functionality. Why am I so excited? Read on and I’ll explain. Search has always been a great way to get content from across the farm. Since the CQWP isn’t able to reach across site collections, we’ve now got a way to get content from anywhere in your farm out of the box. The primary tool for doing this will be the Content By Search (CBS) web part. I hope to dive deeper into this one in future posts. The CQWP could be tuned, but it was common for it to be the source of performance issues in larger implementations. Search will be a far more effient way to surface content in almost all circumstances. The way we’ll plan and think about WCM in SharePoint will fundamentally change. For example in the past, content needed to be in SharePoint for us to roll it up. With the new model, as long as content is in the search index we can surface it where ever we need. So the biggest limiting factor we’d have would be whether we’d be able to get SharePoint to crawl a datasource. This has massively huge implications! A couple years ago I had the pleasure of working very closely with several former FAST folks. They taught me a very important lesson that I’m hoping the rest of the SharePoint world will come to embrace over time — if you look at how most folks search, they typically just type in a search term and get results. This is referred to as keyword searching. The way the FAST folks thought about search went well beyond simple keyword searching — because of the high performance and scale that’s possible through using FAST they were able to use the product to drive content management on several very prominent Internet sites — most notably BestBuy.com. Although BestBuy.com wasn’t a SharePoint site it showed what was possible from a content management perspective with a powerful search engine driving content to the page without anyone actually going in and typing a query. This opens up an extremely complex set of discussions but the main point is this — as SharePoint implementers and users, search provides an immense amount of power once we start thinking about search driving content on pages to users. In the past, most WCM scenarios in SharePoint were fairly simplistic. There’s plenty of examples of projects where very complex things were done but they usually required a high level of development and customization. But now it will be possible to create many of these highly complex scenarios with much less effort. One of the more common phrases you’ll hear applied to SharePoint is “with great power comes great responsibility” and the new WCM capabilities in SP2013 are no different. To deliver a project with this new WCM functionality will likely require that we approach projects in a slightly different way. In future posts I hope to explain this in more detail but I’ll try to give a high level view of what I’m referring to. Planning is key! The first step in any SharePoint should involve planning. But this is more important than ever! I’ve been doing a presentation for the last few years called Getting the Most Out of SharePoint Search (https://johnrossjr.wordpress.com/2012/07/23/getting-the-most-out-of-sharepoint-search-sptechcon-boston-2012/) and the goal has been to help people understand how search works — specifically how to make content stand out and be more relevant. As we move ahead into SP2013 we’ll be able to rollup content from all across our organization in new ways. No longer will we just say “we’ll rollup content from this library and make it show up over here” — we can rollup content in much more complex ways. But if we don’t put enough thought and planning into our metadata for the organization taking advantage of these complex scenarios will be more difficult. Search and WCM skillsets now go hand in hand. This might sound pretty obvious at this point in this post, but it is worth reiterating. 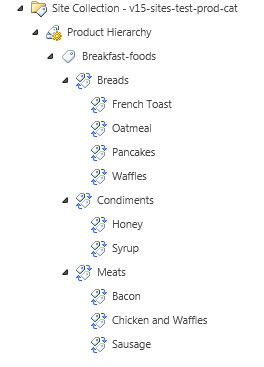 When you think about your new SharePoint site in SP2013 and you know you need to get content onto the page there’s going to be more moving parts. For example, if we have custom fields we need to make sure they are available as metadata in the index. Because if the fields aren’t available in the index, we won’t be able to roll the field up the way it needs to be. How users manage content will change. Today the basic way content is being managed is that users go into a Pages library and create/update content in a WYSIWYG editor. Moving forward, while content can still be managed in the “classic” way like it always has been in SP2010 but it’ll now be possible to potentially abstract content from display. In other WCM products, users can manage content by basically updating data in fields in a database or list. From there the data is then transformed and displayed based on whatever was designed and created by the UX/UI/Designers. 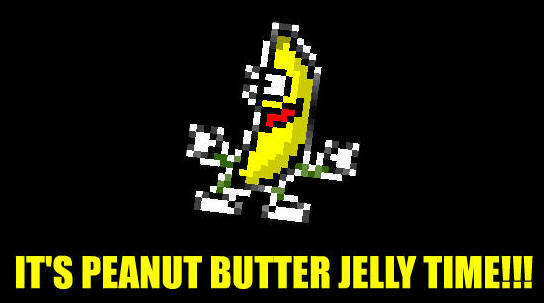 And this concept is now a very real option in SP2013. It adds a new layer of goverance because there’s the potential to more tightly control the presentation in organizations where that are more highly controlled. But the “classic” way of doing things is still going to be there — how we control the mix is still going to be a work in process. Stay tuned on this front. But wait there’s more! The things I’ve mentioned above really just scratch the surface of what’s going to be possible with WCM in SP2013. I just want to be clear about one thing — if you’ve been doing WCM in SP2010 and been happy with it don’t worry, all of those options will still be available to you. The purpose of this post isn’t to scare anyone, just to highlight the new additional options that will be available. Hopefully this post has helped to give you an idea about what WCM in SharePoint 2013 will be all about. On a personal note, my two areas of focus have always seemed strange: WCM/Branding and Search. I used to get strange looks when I told people what I did – I tended to think it was an odd pairing. With the new features and new possibilities they promise I really do think that WCM and Search go together perfectly! I’m excited about the possibilities on the horizon! Be sure to stop by from time to time or follow me on Twitter (http://twitter.com/johnrossjr) as I’ve got a lot of new content in the works that will dive deeper into many of the topics I’ve mentioned throughout this post. If you’ve got any requests be sure to mention them in the comments!